Good move, Michael Crabtree. Just a good move. Sick amounts of injuries yesterday. Urlacher is gone for the season—which basically means that the Bears are done for the season. Donovan McNabb (is he ever not hurt?) injured ribs shouldn't be too bad—Kolb seems at least, capable, and they have a bye week after the third game. The Colts losing Anthony Gonzalez is going to be big. They had better hope its not too serious. Aside from Wayne, none of their wideouts has any experience. Adrian Peterson is the Man. He's been the Man the day he walked onto the Sooner football field, and he's a Man now. Wait! Has the whole world gone topsy-turvy? Is there any story out there right now, better than the Kim Clijsters story. 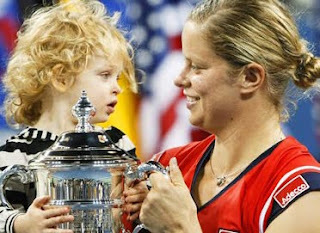 Having retired 2 years ago to have her child, the unseeded Clijsters comes back and beats both Williams sisters en route to the U.S. Open championship. An amazing story. And a cute kid to boot. Going further on the U.S. Open, and the whole Serena Williams thing: Let me just say this. Serena, what the heck is wrong with you? A while back I wrote that it wasn't classy for you to say that while Dinara Safina is ranked number 1 in the world, "We all know who really is number one." However, what Serena did this weekend takes it to a whole new level. I'd say this was a one time thing, but it isn't. Serena has repeatedly shown herself to be a petulant, arrogant, often indifferent tennis player who, unfortunately, happens to be the most talented woman's tennis player of all time. She routinely shows up her fellow tennis players. She loses matches she could easily win just because she doesn't care—and only goes to the smaller matches to get paid and because she is forced to by the Women's tour is forcing her to. She shows no respect for tennis, her competitors or apparently, line judges, who she threatened to stick "this [expletive] ball down your [expletive] throat." Wow, you stay classy, Serena. Really, the sport, and the little girls watching, deserve better. One last thing. Jon Wertheim of SI.com voiced an opinion that I briefly thought of myself. What if Serena, knew she was going to lose to Clijsters (She was down one set, and a point away from losing the entire match), and freaked out on purpose? Sort of like Mike Tyson biting off Holyfield's ear because he couldn't box him? I know, sounds a little fishy—but as Wertheim wrote: "We've seen elite athletes go to greater lengths to delude themselves." Can FoxSports Football please get rid of that weird robot mascot football player. OK, I get it. it's a robot who likes football. Move on now. I think Jake Delhomme might be done, no? OK, for AAPTBNL's Man of the Week. Almost had to give it to the aforementioned Adrian Peterson, but he'll get more chances at that. For now, I give it to Issac Bruce: in one of the most under-reported events of the entire weekend, Bruce passed Tim Brown to become second only to Jerry Rice in career receiving yards. And he did it in two less years than Brown. So, if no one else will congratulate him, AAPTBNL will: Congrats, Bruce! you're the AAPTBNL Man of the Week. And finally, gotta give it to Prince Fielder and the Brewers for having the best Home Run celebration I've ever seen.